Doing for God – Service opportunities are available for all ages to spread God’s love in our congregation, community, and the world. Here are some of our partners in mission to the world. HELPING HANDS FOR THE HOMELESS OF ROCKLAND offers Safe Haven during the cold season and a broad range of homeless services throughout the year. From November through April, we actively participate in the Safe Haven program with volunteers from the congregation preparing and serving home-cooked dinners to the homeless clients who sleep overnight at local area churches and houses of worship. CENTER FOR SAFETY AND CHANGE’S mission is to develop strategies to end gender-based violence and provide shelter and supportive services that empower survivors of domestic violence, sexual abuse and other crimes. Through our annual toiletry drive the congregation donates toiletries, and then volunteers assemble Welcome Kits for women and children moving into their residential shelter, including stuffed animals as well as fleece blankets made by Sew Be It for the children and youth. PEOPLE TO PEOPLE OF ROCKLAND is Rockland County’s largest food pantry working to help struggling Rocklanders through difficult times with dignity. Throughout the year there are opportunities for people to be involved by donating goods as well as their time. In January we run a Healthy Breakfast Cereal Drive to help re-stock their food pantry with breakfast cereal and to ensure that at-risk children get the benefit of a healthy start to their school day. In August, we participate in their “Back to School With Dignity” program by collecting school supplies and backpacks. During the holidays we collect children’s toys, books, warm jackets, hats, and gloves to donate to People to People’s Joy! Store. TOUCH (TOGE THER OUR UNITY CAN HEAL) provides support services and groceries to those in the community who have HIV-related or chronic illnesses. We deliver groceries every week to TOUCH clients. 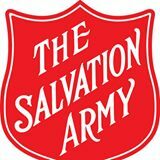 SALVATI ON ARMY, SPRING VALLEY CORPS works throughout Rockland County to provide food and other services to those in need, including providing after-school programs for at-risk children and youth. Every year during the holidays volunteers from Germonds help by ringing the bell during their Red Kettle drive to help raise money to support the Salvation Army’s many programs in the community for people and families in need. MEALS ON WHEELS OF ROCKLAND’S mission is to enhance the wellness of Rockland’s older adults and their families by providing services that support their safety, independence and health. The Blizzard Boxes Program provides non-perishable food packaged in shoeboxes for use when inclement weather prevents volunteers from safely delivering meals to homebound adults. In the Fall, Germonds, along with Busy Bee Playschool, assembles and delivers Covered Cupboards to Meals on Wheels. Children in the congregation help wrap and decorate the shoeboxes. SEW BE IT is a Germonds fellowship group that provides opportunities for the congregation who like to sew or craft to make no-sew fleece blankets and to sew projects for charity such as sundresses for Little Dresses for Africa, children’s hospital gowns, and walker bags. Sew Be It meets the first Saturday of every month. UNITED HOSPICE OF ROCKLAND provides end of life care for county residents, either at home or at their Joe Raso Hospice Residence. 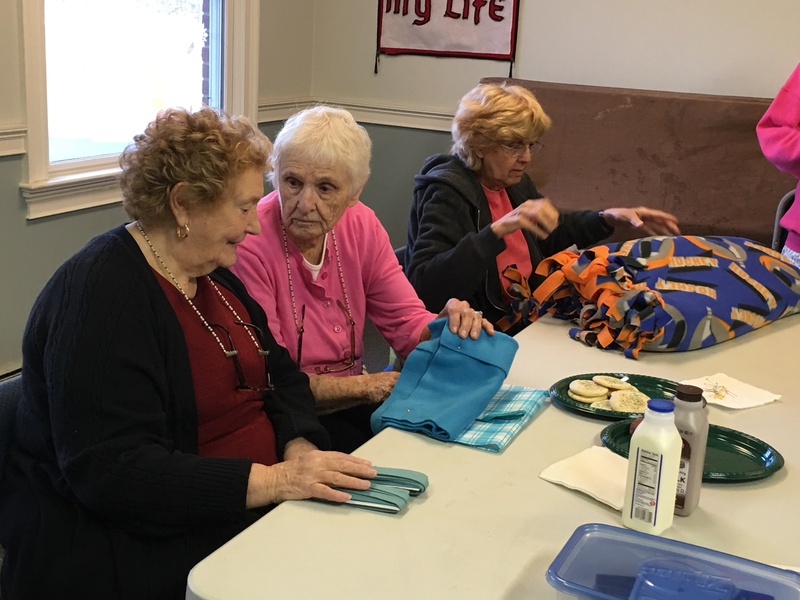 Members of Sew Be It make no-sew fleece blankets for patients in hospice care, and most recently have focused on making these blankets for Veterans. HABITAT FOR HUMANITY OF ROCKLAND’S mission is more than building homes – it is focused on building community and building hope. We provide financial support for their local projects such as Homes for Heroes at the former Camp Shanks location, and currently in Haverstraw where Habitat is constructing a 3-bedroom home.